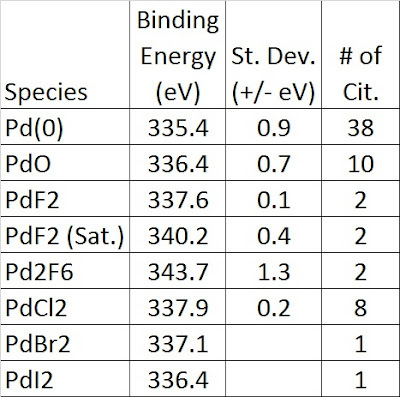 Pd 3d5/2 binding energy values . A) Doublet separation Pd 3d5/2 - Pd 3d3/2 = 5.31 +/- 0.12 eV (8 Cit.). specifies a doublet separation of 5.26 eV. B) PdO is reduced relatively rapidly by X-rays. Take steps to minimize X-ray exposure during acquisition. C) Some references quote B.E. values for PdO2, however PdO is the only well characterized oxide of palladium.